Grilling season is well underway! Here at Cape Porpoise Lobster Co., we love the taste of just-grilled seafood, and shrimp is no exception. Never tried it before? You’re in for a treat. 1. Choose the right shrimp. Jumbo and colossal-sized shrimp are easiest to grill. 2. Preheat your grill to 350 to 450 F.
3. Peel the shrimp prior to grilling, except for the part of the shell around the tail. This will allow whatever marinade you choose to really penetrate the shrimp meat. 4. Devein the shrimp: use a small, sharp knife to make a cut down the back of each shrimp. Then, rinse under cold water while pulling out the vein. 5. Marinate your shrimp for 20 minutes or so. You could use a simple marinade with just olive oil, lemon, salt and pepper, or get creative. The choice is yours! 6. Thread the shrimp on a metal or wooden skewer. 7. Grill the shrimp over direct, medium heat for 2 ½ to 3 ½ minutes per side. The meat inside should be an opaque white, while the outside should be pink. 8. Serve with a side of your choice, like a Greek salad or lemon-pepper asparagus. Want to grill up some shrimp this weekend? Cape Porpoise Lobster Co. offers top-quality, fresh-frozen shrimp and other seafood delights that can be on your grill in just 24 hours. We include free overnight shipping with every order. Call 1-800-967-4268 today and fire up that grill! Grilling season begins Memorial Day weekend, and what’s better to throw on the grill than some delicious lobster? Grilled lobster is a summer classic, and we’re here to show you how to prepare it. A simple recipe lets you prepare grilled lobster in 10 minutes. If using four whole lobsters, begin by combining a pound of good-quality butter with a half-cup of chopped basil or other herb, plus salt and pepper to taste. Chill the butter mixture for at least half an hour. Then, split the lobsters in half lengthwise, cutting only through the meat and keeping the shell connected (the two halves of the lobster should remain slightly attached). Break off the claws and legs, crack with a knife handle, and grill on medium low, covered, for 4 to 5 minutes per side. Next, brush the lobster bodies with oil, season with salt and pepper, and grill flesh-side down over medium for 7 to 8 minutes. Top the lobsters with the butter mixture and enjoy! Use hard-shelled lobster. Soft-shelled, or “new shell” lobster won’t hold together as well on the grill. Speaking of that grill, make sure to oil it or spray it well with cooking spray. 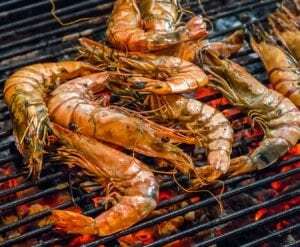 Seafood meat tends to burn easily because it’s delicate. You don’t want your lobster burned or stuck to the grill. 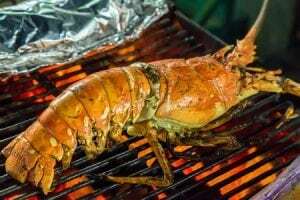 Keep a close eye on the grill, and don’t step away for any reason until the lobster meat is opaque and the shells have turned a bright, red-orange color. Get creative with your basting. Butter is often the base, but you can try different herbs and spices. You could even add tequila and lime! Want to grill up some lobster this Memorial Day weekend? Cape Porpoise Lobster Co. offers top-quality, fresh Maine lobster tails that can be at your door in just 24 hours. We include free overnight shipping with every order. Call 1-800-967-4268 today and get grilling! Posted May 2, 2018 by Cape Porpoise Lobster Co.
It’s one of the questions we get often: why do we have to boil lobsters alive? People love to eat fresh Maine lobster—but not everyone likes to see, or hear, the crustaceans be prepared for our consumption. But what if we told you that boiling is, in fact, the safest way to eat lobster for our own health? Let’s say we don’t boil the lobster, and kill them like any other fish. Chances are, within hours, their decaying bodies will be preyed on by the Vibrio bacteria, a nasty microbe that causes severe food poisoning in humans. So now, you’ve eaten the lobster, and you’re not feeling too good—cramping, vomiting, fever, and chills, which can sometimes be fatal. Well, you might ask: why don’t we just boil the lobster right before we serve it? Turns out, once the bacteria gets into the decaying lobster meat, it’s nearly impossible to get out, even by boiling it. So it makes the most sense to keep the lobster alive until the very last moment—which is why you see it in window cases filled with water in restaurants everywhere. There’s also an ethical case to be made. Lobsters, experts say, are not like chickens or pigs, which you’d never boil because they are more conscious. Lobsters’ nerve systems may not actually be able to register pain, or know what pain is. That is why here at Cape Porpoise Lobster Co., we ensure that we’re serving the freshest Maine lobster around, and we do it in a way that respects the creature’s way of life. We love lobsters as much as you do, and know that they are considered amongst many experts to be a healthy addition to any diet. So we strive to take care of both of our customers, and lobsters. If you have any questions about our fresh Maine lobsters, don’t hesitate to contact us today by calling 1-800-967-4268! 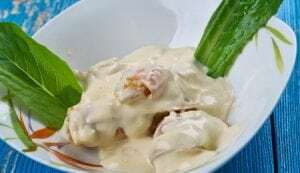 Lobster Newburg is one of the classics of American seafood cooking. Creamy, saucy, and rich, it’s sure to impress the guests at your next dinner party. There are a few different theories as to how the dish came about, but the most popular holds that it was created in 1876 at Delmonico’s Restaurant in New York City. Originally called Lobster Wenburg, it was named after a wealthy sea captain, Ben Wenburg. When Wenburg had a falling out with the owner of Delmonico’s, the latter changed the name to Lobster Newburg. To make Lobster Newburg for four, begin by whisking together two egg yolks and a half-cup of heavy cream in a small bowl until well-blended. Set the mixture aside while you melt a quarter-cup of butter or margarine in a saucepan over low heat. When the butter is melted, mix in the egg and cream mixture, along with two tablespoons of dry sherry or madeira. Continue to cook over low heat, stirring constantly, until the mixture thickens. Be careful not to let it boil! When the mixture is thick, remove it from the heat and add a half-teaspoon of salt, a pinch of ground nutmeg and a pinch of either cayenne pepper or paprika. Add three-quarters of a pound of cooked lobster meat, broken into chunks. Return the pan to low heat and continue to cook until the dish is warm. Serve over buttered toast, and enjoy! Now that you know how to make Lobster Newburg, it’s time to buy some top-quality lobster. Cape Porpoise Lobster Co. has fresh, delicious lobster available at affordable prices, and we can get it to you quickly! We offer free overnight shipping with all orders of our lobster and other seafood products. Call 1-800-967-4268 today to place your order. How Many Lobsters Do You Need for Lobster Rolls? Posted April 6, 2018 by Cape Porpoise Lobster Co.
Picture this: It’s Friday night, and you’ve decided to have some friends over for dinner. You’re making lobster rolls—great choice! However, there’s just one hitch. You have no idea how many lobsters to buy! You don’t want anyone to leave hungry, but you also don’t want to leave delectable lobster untouched on anyone’s plate because there was just too much food. At Cape Porpoise Lobster Co., we make things really simple for you with our handy lobster calculator. If you’re making a lobster roll just for yourself, all you need is a half-pound of lobster to make our easy, delicious lobster roll recipe. Knowing how much you need for one lobster roll makes it so easy to multiply. Dinner for two? Get one pound of lobster. A lobster roll feast for 10? Five pounds should do it. Want to save a few bucks? It’s a great idea to purchase freshly cooked lobster meat without the shells if you’re making lobster rolls, or another cooked recipe like lobster scampi. If you’re eating whole lobster, the general rule is one lobster per person, taking into account that different people might have larger or smaller appetites. An average eater would enjoy a lobster weighing around two pounds. Ready to make those lobster rolls? Check out Cape Porpoise Lobster Co. for freshly caught, delicious lobster and other seafood delights. We offer free overnight shipping with all orders of our delicious seafood products, which means that you’ll be whipping up those lobster rolls in no time! Call 1-800-967-4268 today to place your order. Posted March 22, 2018 by Cape Porpoise Lobster Co.
There’s nothing more exciting than sitting down with family or friends for a delicious lobster feast. However, there’s also nothing worse than clearing your plate and still feeling hungry, or leaving untouched lobster meat on your plate because your eyes were bigger than your stomach. So how do you choose the right size to purchase? Next time you go out to purchase lobster, follow some of these simple guidelines. While it may be tempting to share, ideally, each person should have their own individual lobster. This is for two reasons. For one, larger lobsters will weigh more with a larger percentage of meat, so they will also cost more. Secondly, each person should get to enjoy every part of their lobster. Everyone likes their own portion so why rob them of the opportunity to enjoy themselves? It may seem obvious, but many people forget that they should buy their lobster based on how many pounds they realistically think they can eat. Those with a smaller appetite should try what is considered a half lobster. No, these are not lobsters that are cut in half; instead, they are whole lobsters that usually weigh about one and a half pounds. Average eaters would be smart to purchase a two-pound lobster, also known as a deuce. This hefty lobster will suit the average eater while also being great for special occasions. They are a little costlier but well worth it. Those with a big appetite would be thrilled to sit down with a jumbo lobster. Clocking in at three pounds or heavier, these lobsters are considered to be a truly indulgent meal and are great for fun occasions like a Father’s Day feast. Here at Cape Porpoise, we have some of the largest lobsters Maine has to offer! 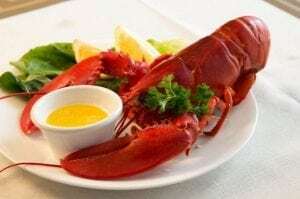 If you are planning to eat lobster in a different way, such as in lobster rolls, scampi, or lobster mac and cheese, save money by purchasing fresh cooked lobster meat without the shells. If you aren’t focused on presentation, you can buy culls to save even more on your meal cost. At Cape Porpoise Lobster Co., we offer the most delicious live Maine lobster that you can find, and we offer it at great prices. Call us today at 1-800-967-4268 to learn more! 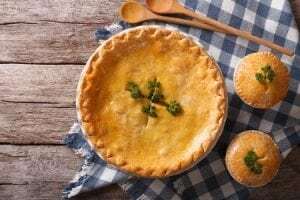 If you’re looking for a new way to enjoy lobster, why not try your hand at a lobster pot pie? 1. Start by preheating your oven to 425, and greasing 4 two-inch ramekins or spraying them with nonstick cooking spray. 2. Put a cup of chopped Yukon gold potatoes, a half-cup of sliced carrots and 3 cups of low-sodium seafood stock into a saucepan, then bring it to a boil over high heat. Cook the veggies and stock for 8 to 10 minutes, then strain the stock into one bowl and put the veggies in another. 3. Put a tablespoon of olive oil and 3 tablespoons of butter in a large stock pot, and melt to combine over high heat. 4. Add 4 lobster tails (with their shells removed) and cook for two to three minutes, until slightly red and opaque. Remove and set aside. 5. Put a diced sweet onion and a teaspoon of chopped fresh thyme into the stock pot, stirring well to coat. Add salt and pepper to taste, then cook for about five minutes, until soft. 6. Create a roux by adding 3 tablespoons of all-purpose flour, whisking until it’s gold in color and fragrant, about 4 minutes. Then, add 2 tablespoons of tomato paste and cook for an additional minute. 7. Pour in ¾ cup dry sherry, cooking until the sherry is reduced by half. Then, slowly stir in the stock you set aside, followed by the veggies, the kernels from two ears of fresh corn and a cup of cream. Once the mixture is simmering and slightly thickened, add the lobster and salt and pepper to taste. 8. Spoon the filling into ramekins, and top with squares of puff pastry cut to fit and brushed with egg beaten with water. 9. Bake for 25 to 30 minutes. Want to make this recipe? 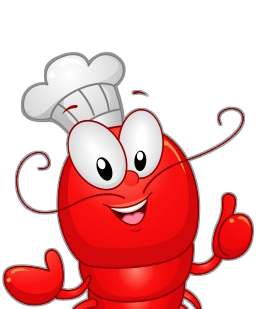 Cape Porpoise Lobster Co. offers top-quality lobster that can be at your door, ready to cook, in as little as 24 hours! We include free overnight shipping with every order. Call 1-800-967-4268 today! Posted February 22, 2018 by Cape Porpoise Lobster Co.
One of the things that we love about fresh Maine lobster—and believe us, there are many—is how well it goes in a number of dishes. Just think about the amount of lobster-based dishes that you know, and love: lobster bisque, lobster mac and cheese, lobster rolls, and just the lobster itself, with just a bib and some butter. 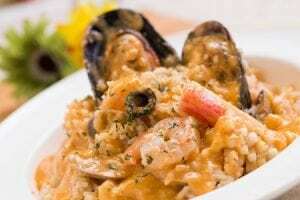 But one dish we’ve been loving lately here at Cape Porpoise Lobster Co. is the lobster risotto. The good news: it’s easy to cook! You’re going to want to start off by chopping up a stalk of celery and a peeled yellow onion, and placing those in a large saucepan with about two tablespoons of olive oil. Cook those on medium heat, or until the onions are translucent, for about 3 to 4 minutes. Then add 8 cups of seafood stock, and frozen fresh Maine lobster tails (four is preferable). Bring it to a boil, and then let it simmer for 10-12 minutes. Once done, take the lobster tails, and let them cool off enough so you can remove and chop the meat up. Then you’re going to want to strain the stock, and put it back into the saucepan. Leave that to the side. Now, onto the risotto. In another large saucepan, heat up some butter and olive oil on medium-high heat, until melted. Then add another peeled yellow onion and some leeks—both chopped—and cook until soft, or 5 minutes. Add two cups of Arborio rice, and stir it to coat before adding in a half cup of white wine. Allow it to cook and absorb, or about 2 minutes. Alright, back to that lobster stock. You’re going to want to add one cup at a time to your risotto, allowing it to absorb after 2 minutes of cooking. Eventually, after 20 minutes, the risotto will become nice, tender, and tasty. That’s when you’ll want to add in your Parmigiano-Reggiano cheese, salt, and pepper, for taste. But wait, the lobster! Add in the chopped lobster meat, along with some chives, to your risotto, and cook for about 2 minutes, until the lobster meat is the same temperature as the rice. Once it’s there, you’re finished! Divide into bowls, and add more cheese or chives if you’d like. Last but not least, enjoy! Place your order with Cape Porpoise Lobster Co. today for tasty seafood tomorrow! From grilling to broiling and pan searing to deep frying, there are plenty of ways to cook your fresh sea scallops. The easiest way to sear your scallops to perfection? On the stove top! Before you begin cooking, there are a few preparatory steps you will need to take to ensure the best possible flavor. If ordered frozen, thaw your scallops overnight or quickly defrost them using a microwave. If desired; cut scallops in half to create smaller portions. Once you finish these simple, initial preparation steps, you are ready to start cooking. Cooking scallops on a stove top is the quickest and easiest way. We recommend a heavy pan, made of either cast iron or stainless steel for best results. 1. Heat pan on medium-high heat, melting 2 tablespoons of oil. The best oils for cooking scallops include canola, soybean and peanut. 2. For some extra flavor and texture, you can create a thin crust by dusting the scallops in flour. Use about 3 tablespoons of flour per pound of scallops, lightly coating them in it before placing them in the pan. 3. Place the scallops in the pan and cook them for about 6 minutes, flipping half-way through. Now that you’re ready to prepare your meal, visit us online or call us at 1-800-967-4268 to place your order for fresh Atlantic sea scallops. Planning a special dinner? One delicious and gourmet option your loved one will enjoy is lobster. Delivered right to your door by Cape Porpoise Lobster Co, all you have to do is toss the crustaceans in a pot! 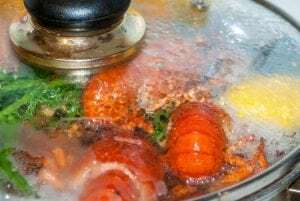 There are so many ways to cook lobster, but boiling is one of the most straightforward – and tasty – ways when it comes to serving whole lobsters. 1. The first thing you will need is a large pot filled three quarters of the way with water. You should also include two teaspoons of salt per quart of water. Depending on how many lobsters you are planning to cook, at eight or 16 quart pot can be used. You can cook lobsters one at a time in an eight quart pot or two to three at a time in a 16 quart one. 2. When the water has come to a rolling boiling, it is time to drop the lobsters in, head first. Remember to remove the rubber bands around their claws first and lower them into the water slowly, using a pair of tongs. 4. When fully cooked, the lobsters outside shell will be a bright red and the meat will be opaque white in color. Carefully remove your crustaceans from the heat, placing them on a platter to cool down before serving. Another great way to cook lobster is steaming. The process is quite similar to boiling, creating a tender main course for your next big get-together. It is also a bit more difficult to overcook a lobster when steaming, so this technique is great for first time lobster chefs! 1. Add about two inches of salted water to a 16 quart pot, set a steaming rack inside and bring the water to a boil. We recommend checking on dinner half-way through, moving the crustaceans around to ensure even cooking. 3. 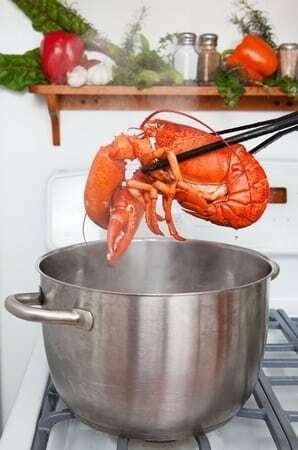 When the timer rings, take the lobsters out of the pot with a pair of tongs, checking that they are bright red in color and the meat inside is an opaque white. Now that your lobster is fully cooked, it is time to dig in! Dining on lobster can be a bit messy, so we recommend placing a couple bowls on your dinner table for shells, along with plenty of napkins and nutcrackers for prying shells apart. Especially if you aren’t sure how your guests usually eat their lobster, provide a few dipping options. Lemon juice, mayonnaise and hot, melted butter are some traditional favorites. Now that you’re hungry for a delicious lobster dinner, it’s time to place your order with Cape Porpoise Lobster Co. Shop with us online or give us a call at 1-800-967-4268 today!